The curriculum is designed to develop fundamental knowledge in the chemical engineering core areas (thermodynamics, transport and kinetics), while research opportunities are available in advanced materials, catalysis, biotechnology, functional interfaces, electrochemistry and theory and simulation through faculty-run research groups. Successful completion of an MS degree in chemical engineering typically leads to high-level professional positions or continuing on to a PhD degree. Recent graduates from the MS program currently hold positions places like St. Gobain, IBM, Exxon-Mobil, 3M, and Stanford University. Students pursuing the thesis-based MS degree are expected to earn 30 credit hours, with at least 18 credit hours from graduate level coursework. Students who choose this option must also satisfactorily complete their master’s thesis and pass an oral defense. Most students complete the Plan A program in two years. Students who pursue the coursework-based MS degree must earn a minimum of 32 graduate credit hours. At least 18 credits should be courses within the chemical engineering department. 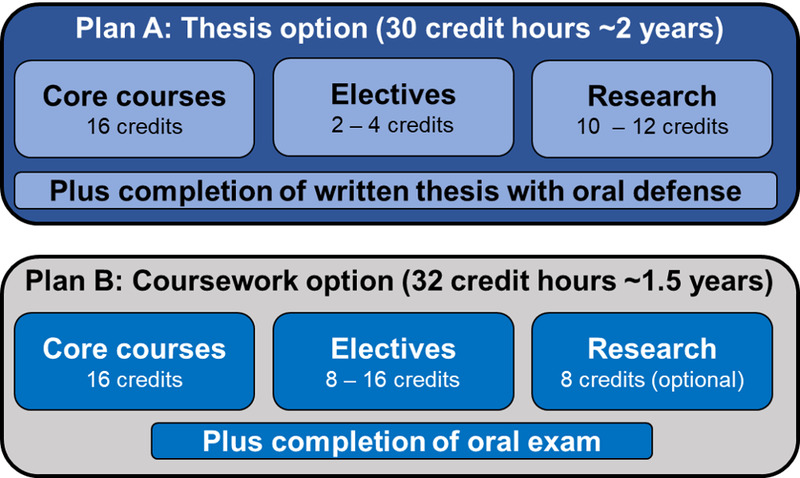 Students who choose this option are required to pass an oral exit exam. Most students complete the Plan B program in a year and a half. For first-year MS students, academic advisors are assigned by the Graduate Student Committee. If a student decides to choose the research-based Plan A program, the selected research advisor becomes your academic advisor. Students should select a research advisor by the end of their first fall semester. For information about applying for admission and for financial aid visit the applying page. Students should hold a BS in chemical engineering or a closely related field. Applicants can be eligible for up to a 40 percent tuition waiver through the Dean’s Office.